CONSTRUCTED WITH SAFE, DURABLE MATERIALS --- Heavy duty and 100% pet safe, the amusing pair of SunGrow Triple Knotted Rope Bones are ready to be played with right out of the package. Made with tightly twisted, durable cotton yarn, these fun and long lasting 20" (51cm) long chew toys for dogs are designed for daily play and are easy on the teeth of your beloved pets. The cotton fiber is free from chemicals and plastics, safe for dogs of all ages. INTERACTIVE TOY FOR BONDING AND EXERCISING --- Perfect for playing tug-of-war and other games with your family dog, the strong and enticing SunGrow Rope Toy for Dogs provides stimulation, entertainment and exercise for the whole family. The triple knotted twisted rope bone is great for dog and family bonding time, two new playmates getting to know each other or one dog chewing on the rope by himself. A fun way for both you and your dog to get a workout while enjoying each other's company. COMFORTABLE WAY TO CLEAN DOG'S TEETH --- Not only are the attractive and charming SunGrow Twisted Rope Toys for Dogs fun and addictive, they are also a great way to help prevent dental diseases in your canine companion. By allowing your dogs to chew on the soft, yet durable knotted rope bone, they will inadvertently be flossing their gums with the cotton rope fibers and cleaning their teeth while they play and chew with their new favorite toy. 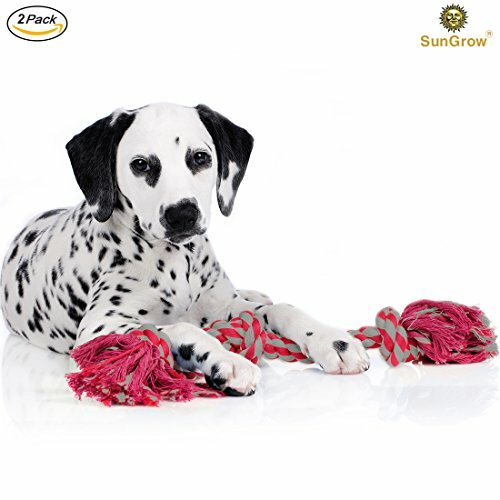 BRIGHTLY COLORED AND EASY TO FIND --- If your family dog, like many other dogs, likes to hide his toys, the brightly colored SunGrow Triple Knotted Rope Bone is easy to find. Whether it's under the couch, on the bed or in the doghouse, the vibrant red and grey striped dog toy will stand out and be easy to recover. Feel free to play fetch or tug-of-war outside with the colorful rope without worrying about losing it in the yard. My Dogs Love This Toy!